A strong valuation for the luxury hybrid electric vehicle. With pioneering EV maker Tesla at a $2.07 billion market cap and a strong market reception for the Nissan Leaf and Chevy Volt, other EV aspirants and investors are eyeing electric vehicles as a growth market. To this end, Fisker Automotive of Irvine California raised $150 million in new VC funding. Here's a link to the most current SEC Form D Filing. Investors in Fisker include new investor New Enterprise Associates and existing investors like Kleiner Perkins Caufield & Byers, A123 Systems Inc., Ace Investments, Palo Alto Investors, Qatar Investment Authority, Advanced Equities, and Quantum Fuel Systems. The startup has raised around $500 million in venture capital. Last January, Fisker raised $115 million to secure a $537 million loan from the DOE. VentureWire reports that the round was done at a $600 million pre-money valuation. 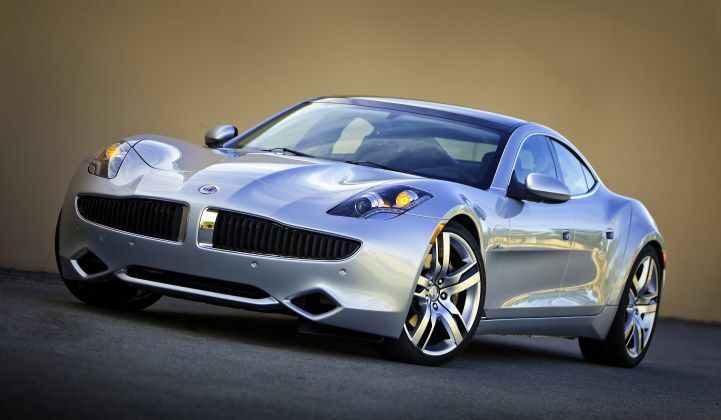 Fisker wants to come out with its first car, the Karma, this quarter. Initially, the car was going to come out in late 2009 and then in late 2010. The car is a series hybrid, similar to the Chevy Volt. That is, it has a lithium-ion battery pack (with battery cells from A123 Systems) that propels the car. The Karma also comes with a gas generator to recharge the batteries when they get down to around a 20 percent state-of-charge. It can also help propel the car. The gas engine helps give the Fisker and Volt a longer range than pure electrics like the Tesla Roadster or Nissan Leaf. The battery pack on the Karma only takes the car 50 miles, longer than the average commute, but the gas engines helps it go a few hundred. The gas engine, however, adds weight. Fisker's generator is an engine from a Pontiac. The Fisker, in fact, has two, not one, electric motors. One disadvantage: California puts stringent regulations on series plug-in hybrids. While both the Karma and Volt qualify for the $7,500 federal tax credit, getting the $5,000 California tax credit is tricker. The current Volt does not qualify, putting GM at a disadvantage to Nissan. GM will come out with a California version of the car that will qualify in 2012, the company recently told us. It is unclear if the Karma or the Nina, a mid-range sedan coming in 2012, will qualify. The Karma will cost around $95,000, up from an estimated $88,000 previously quoted. The Nina, a mid-range sedan, is still slated for 2012 and will cost around $40,000. Tesla's sedan comes in 2012, as well. Like Tesla had before the launch of the Roadster, Fisker has an extensive waiting list for the Karma. Hendrik Fisker is also a hero to many automotive reviewers, who have been looking forward to the car.